Near the beginning of the E3 demo of Irrational Games' Bioshock Infinite, there's a moment when... well, it's the sort of thing that when you talk to other people who have seen it you say, "You know... that part?" And they nod knowingly and say, "Oh yeah. That part. That was awesome." It starts when Booker DeWitt's sidekick-slash-magical-teammate-slash-damsel-in-distress Elizabeth goes to heal an injured horse by opening up a hole to a parallel reality. While doing so, she accidentally rips a tear into an entirely different world... from the future. A rainy urban scene intrudes upon the colorful Columbian roadway, and a giant neon movie marquee reads: "Revenge of the Jedi." Without warning, a massive, clanging firetruck blasts towards our protagonists, freaking them the hell out as Elizabeth slams the gate shut. Talking to Gamasutra, Infinite's Creative Director Ken Levine revealed that the assets for that sequence came from an entirely different, cancelled game. So, Irrational had been working on a game that featured an urban vibe and a lot of neon. What could it have been? 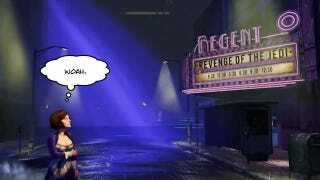 And will we see more of it in Bioshock Infinite?